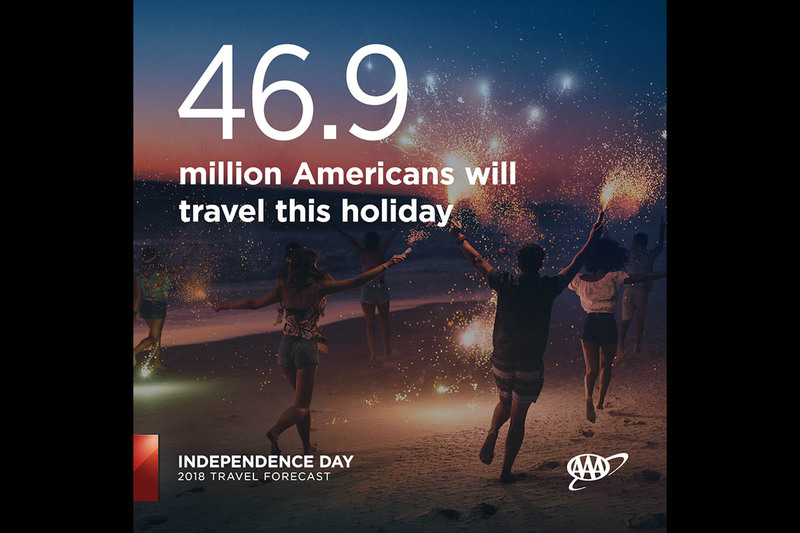 Orlando, FL – A record-breaking 46.9 million Americans will travel 50 miles or more away from home this Independence Day holiday, an increase of more than 5 percent compared with last year and the highest number since AAA started tracking 18 years ago. In addition to strong economic variables, the expected increase in travelers this year is helped by Independence Day falling on a Wednesday, giving travelers more flexibility to schedule a trip the weekend before or after the holiday. The Independence Day holiday period is defined as Tuesday, July 3rd to Sunday, July 8th. INRIX, in collaboration with AAA, predicts drivers will experience the worst congestion over the holiday week on Tuesday, July 3rd in the late afternoon – as commuters leave work early and mix with holiday travelers. Travel times could increase two-fold in the major metros across the U.S., with drivers in Los Angeles, New York and Washington D.C. experiencing the most significant delays. Gas prices have slowly but steadily started to fall since the 2018 high of $2.97 set over Memorial Day weekend. Since then, the national gas price has dropped nine cents to $2.88 (as of June 20th), which is 59 cents more than one year ago. However, the higher prices are having little effect on travelers this Independence Day, with record number of travelers still planning to hit the road this year. Before heading out on a trip for Independence Day, download the free Mobile app for iPhone, iPad and Android. Travelers can use the app to map a route, find the lowest gas prices, access exclusive member discounts, make travel arrangements, request AAA roadside assistance, find AAA Approved Auto Repair facilities and more. Learn more at AAA.com/mobile. With the Mobile app, travelers can also find nearly 59,000 AAA Diamond Rated hotels and restaurants. AAA’s is the only rating system that uses full-time, professionally trained inspectors to evaluate each property on an annual basis. Every AAA Inspected & Approved establishment offers the assurance of acceptable cleanliness, comfort and hospitality, and ratings of One to Five Diamonds help travelers find the right match for amenities and services. As North America’s largest motoring and leisure travel organization, AAA provides more than 58 million members with travel, insurance, financial and automotive-related services. Since its founding in 1902, the not-for-profit, fully tax-paying AAA has been a leader and advocate for the safety and security of all travelers. Motorists can map a route, identify gas prices, find discounts, book a hotel and access AAA roadside assistance with the AAA Mobile app for iPhone, iPad and Android. Learn more at AAA.com/mobile. AAA clubs can be visited on the Internet at AAA.com. AAA, App, California, Fourth of July, Gas Prices, Independence Day, INRIX, Los Angeles CA, New York NY, Orlando FL, washington d.c.
Will Brexit affect European travel?